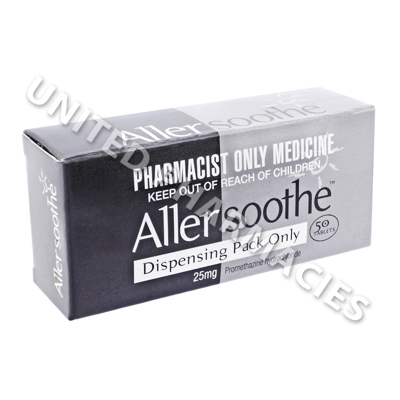 Allersoothe (Promethazine) is an antihistamine drug which is used for two primary purposes. Many patients use it to treat and prevent allergies, such as hay fever and urticaria. It can provide relief from itchiness and nasal congestion, which often occurs as a result of allergies. This drug is also widely used to prevent nausea and other symptoms of travel sickness. Allersoothe (Promethazine) is an antihistamine drug which is used for two primary purposes. Many patients use it to treat and prevent allergies, such as hay fever and urticaria. It can provide relief from itchiness and nasal congestion, which often occurs as a result of allergies. This drug is also widely used to prevent nausea and other symptoms of travel sickness. In addition to this, it may occasionally be used to treat insomnia or to prevent nausea occurring before surgery. The main ingredient in this medicine is an antihistamine, and it works by blocking the action of histamine, a natural chemical which can cause allergy symptoms. Dosages can vary for patients taking Allersoothe (Promethazine) tablets, and the advice of a doctor is always necessary before taking this medicine. Patients treating allergic rhinitis are sometimes told to take 25mg before going to bed, or else 12.5mg before eating an evening meal followed by another 12.5mg at bedtime. If this drug is being taken to prevent motion sickness, it is possible that the patient will be told to take 25mg 30 to 60 minutes before commencing travel, after which it may be taken every 12 hours as necessary. The dosage for other conditions will vary, and will be decided by the prescribing doctor. Inform your doctor about any side effects which occur after taking this drug. In extreme cases, serious side effects can occur. You will need to consult your doctor immediately if you notice hallucinations, muscle stiffness, confusion, fever, bruising or any other symptoms of a serious reaction. This medication should never be used in children younger than 2 years old, as there is a possibility of it causing serious and potentially fatal breathing problems. In addition to this, older children should not be given this medicine unless a doctor prescribes it for this purpose. This medicine may make the skin more sensitive to sunlight. Patients are advised to apply sunscreen outdoors, and to cover any exposed skin with clothing. Always use Allersoothe (Promethazine) as you have been prescribed by your doctor. Never self-medicate or change your dosage without first consulting your doctor. The correct dosage can vary depending on your health, medical history, and the severity of the condition being treated.